« Meet Your New Principal! New: Free breakfast at every 4J elementary school! We know how important a nutritious breakfast is to help students get the most out of school. Studies consistently show that children who eat a healthy meal before school have longer attention spans and perform better academically. Eugene School District 4J is excited to offer free breakfast to all students in grades K–5—more than 7,000 students—for the entire 2017–18 school year. No paperwork or application is required to receive free breakfast. Students simply show up at breakfast time (check with your school for start times) and enjoy a healthy, nutritious meal to start their day off right! Students do not have pay or submit an application to eat these nutritious meals for free. For school meals other than those listed above, you may apply to qualify for free school meals. Until you apply and qualify, or if you do not qualify, there is a charge for school meals. 4J Nutrition Services provides healthy, fresh and local options including unlimited fruits and vegetables with every meal. On an average day, 3,400 breakfasts and 6,100 lunches are served to students at 31 school sites. More than 60% of meals are served in the elementary schools. 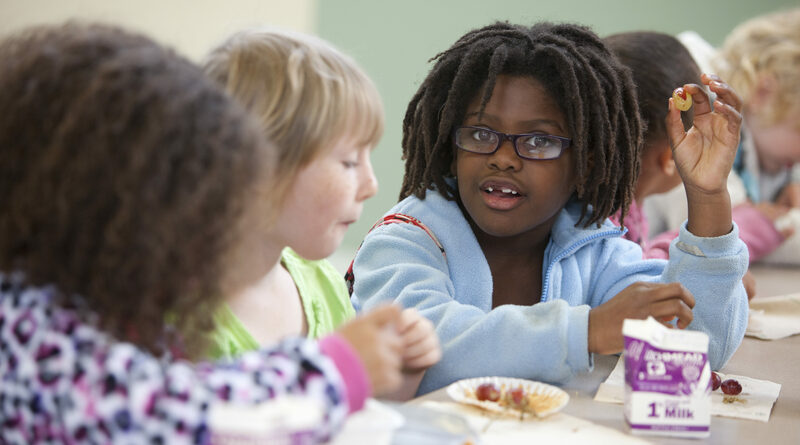 87% of the meals in elementary schools are served to children who are eligible for free or reduced-price meals. More than half of our 4J elementary school students have family income or circumstances that qualify them for free or reduced-price school meals. Many students rely on school meals for much of their daily food. This entry was posted in Featured, News, Nutrition Services. Bookmark the permalink. Both comments and trackbacks are currently closed.